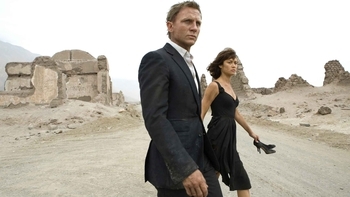 Quantum of Solace is a Film programme that first aired in 2008 and has been classified a 12 certificate. Following the death of Agent Vesper Lynd, James Bond (Daniel Craig) is determined to bring down the terrorist network responsible. With the shady Mr White (Jesper Christensen) in his custody, Bond looks to be one step closer to dismantling the nefarious organisation until a betrayal leads to the criminal's escape. Pursuing a lead to Haiti, 007 learns that wealthy environmentalist Dominic Greene (Mathieu Amalric) is somehow involved. Teaming up with the beautiful Camille (Olga Kurylenko), a local pursuing her own vendetta against Greene following the murder of her family, Bond learns that the merciless mogul is involved in a plot to overthrow the Bolivian government and seize the country's vast oil supplies. Setting out to scupper Greene's schemes, Bond heads for Bolivia where his fledgling double-O skills will be put to the ultimate test. Clearly out to give young upstart Jason Bourne a run for his money, this second outing for Daniel Craig's martini-swilling bruiser is a non-stop cavalcade of furious, in-your-face action. From the intimately brutal hand-to-hand combat scenes to the bone-jarring stunts, it's clear that Matt Damon's gritty blockbuster trilogy has made an impression on Bond's producers. All the classic elements that define a 007 film are here, however, from the sardonic one-liners to the feisty femme fatales, with both Ukrainian-born Kurylenko and Brit Gemma Arterton as sassy MI6 girl Agent Fields making a lasting impression. Following on directly from Casino Royale, Quantum of Solace is the first straight sequel in the Bond canon. As such, the continuing story arc gives the excellent Craig the opportunity to further develop his fledgling agent, the steely-eyed killer of the previous film slowly growing into the 007 audiences know and love in this unmissable high-stakes Bond adventure.